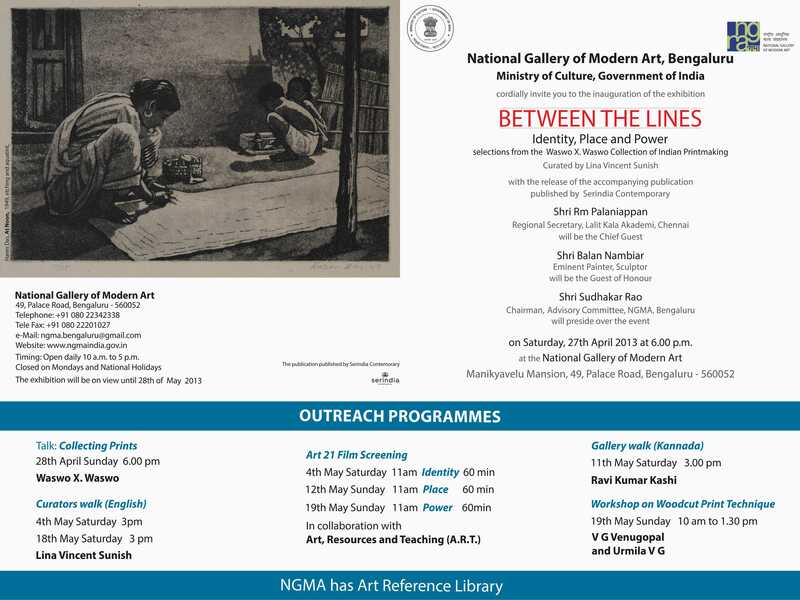 Bangalore: The National Gallery of Modern Art, Bangalore, has organized a month-long exhibition on Indian printmaking in the city. The exhibition opened on April 28, 2013, and will continue till the end of May. The exhibition is titled ‘Between the Lines’, and has been curated by Lina Vincent Sunish, an art historian from Bangalore. The exhibition is mainly based on Indian prints from the private collection of Waswo X. Waswo that document the trends in Indian printmaking over the last 100 years. Waswo is an artist hailing from Wisconsin, USA, who now lives in India, and has a special interest in Indian printmakers and their work. The opportunity to view works from a private collection is bound to raise interest within art circles. Art collectors are the ones who ultimately drive the market as well as dictate future trends. When an public institution as important as the National Gallery of Modern Art (NGMA) decides to go ahead with an exhibition displaying a private collection of Indian prints, be assured that it will be a comprehensive show as well as a learning experience. The exhibition tells the complete story of Indian printmaking through a variety of printing techniques on display, including etchings, lithographs, woodcuts and serigraphs. Programs have been designed to help the general public as well as artists and students understand Indian history through these prints. What makes the show a ‘must-visit’ is the timeline of the collection. While some of the prints date back to 1917, the more contemporary prints count some as recent as 2012. There are about 152 works by 79 artists displayed from the collection. This exhibition was first held at the Visual Arts Gallery of the India Habitat Centre in Delhi, which we blogged about here. It is accompanied by a comprehensive catalogue titled ‘Between the Lines: Identity, Place, and Power – Selections from the Waswo X. Waswo Collection of Indian Printmaking‘.